Helicopter Tour in Nepal is getting day by day most popular alternative means of adventure journey in mountains and other remote destinations. Taking a Nepal helicopter flight tour over the Himalayas is a magnificent adventure, filled with awe-inspiring scenery and beautiful peaks. You get to feast on the impressive vistas of snow-capped peaks, glaciated passes, quaint village settlements and panoramic landscapes. The Nepal Helicopter tour is a time-honored choice for the mountain lovers who have a short period but wants to observe such massive Himalaya sequence and sightseeing. 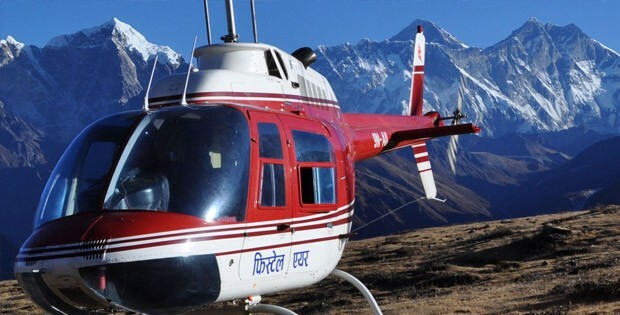 Nepal helicopter tour flight traveling gives you an exclusive opportunity to bask in the splendors of nature and experience exciting airborne explorations of Nepal. Nepal, having high mountains and beautiful scenic countryside but is easily accessible by land transport, is known as “Helicopter Country.” Aerial sightseeing flights in Nepal over the heritage and tourist spots are quite popular these days. We assure you to use the best helicopters that give you an exceptional experience as a matter of your safety and satisfaction. Your scenic visiting Nepal in Helicopter tour will be undoubtedly comfort and exciting. The most spectacular flight take you very close to the world’s highest mountain range with a helicopter tour of Nepal. The pilots are very experienced professionals with thousands of flying hours experience and with knowledge about the viewpoints. Nepali airlines offer helicopter tour services in different beautiful and amazing spots of Nepal which are universally adored. The popular helicopter tours are Everest helicopter tour, Annapurna Helicopter tour and Langtang helicopter tour. The helicopter tours can be used for pleasure as well as for practical purposes: from tourist enjoyment, trekking, and mountaineering to technical and scientific works.